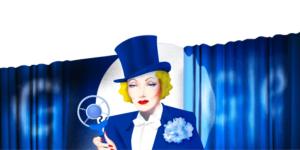 This entry was posted in Film and tagged Classic Film, Classic Hollywood, Entertainment, Google Doodle, Marlene Dietrich, Movies, Old Hollywood by maedez. Bookmark the permalink. Was thrilled when I saw this on Google yesterday. I thought, “Get out – that’s not Marlene Dietrich, is it?” And sure enough, it was. Two thumbs up! I had to do a double-take, too. I love it!